Julia says “Thank you for dropping by! 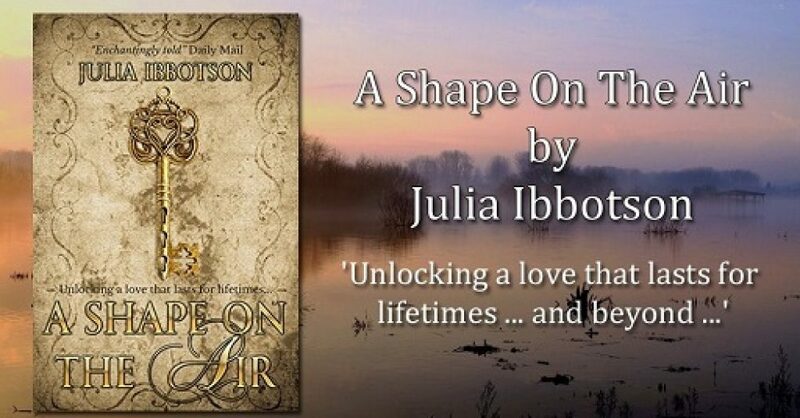 A Shape on the Air, a historical time-slip romance (early medieval/dark ages), from Endeavour Media. Unlocking a love that lasts for lifetimes – and beyond: when Viv, a medievalist and lecturer, slips into 499 AD and into the body of Lady Vivianne, little does she realise that both their lives across the centuries will become intertwined as they fight for their dreams … and their lives. The ebook version from Endeavour Media, with a different cover from the paperback edition, is here. It’s 1965 and feisty 18 year old Jess flees her strict religious background in England to find herself in Ghana, West Africa. She finds danger, civil war and unexpected romance, but why do the drumbeats disturb her dreams? The original paperback edition is also still available from Amazon. The trilogy continues with Jess’s story in Walking in the Rain and Finding Jess. Walking in the Rain, the second in the Drumbeats trilogy, is available in ebook and paperback editions from Amazon (Endeavour Media). Jess marries the guy of her dreams … but is he the man she thought he was? And is her world about to shatter around her? The final book in Jess’s story, Finding Jess, was published summer 2018. How can Jess rise above the betrayal of her beloved husband and best friend? How can she find the strength to take control of her own life again? Finding Jess “is a passionate story of love and betrayal and of one woman’s bid to reclaim her self-belief and trust after suffering great misfortune. It is a feel-good story of a woman’s strength and spirit rising above adversity“. The whole trilogy is a saga over 30 years of love, betrayal and second chances. It’s available now as an omnibus edition in ebook from Amazon. All three are still available as separate editions in ebook and paperback. Julia has also published a children’s novel called S.C.A.R.S (find out later what that stands for!). This book is about a time-shift journey of discovery of parallel or quilted universes. Worlds collide when Gavin, having a hard time at home and at school, slips through a tear in the universe to find another, fantasy medieval world. Will the different worlds affect each other for good or for bad? Will Gavin ever beat the bullies or find his dad? Julia is the award-winning author of The Old Rectory: Escape to a Country Kitchen, first published to acclaim in the USA and re-launched by her English publisher in the UK, Endeavour Media (summer 2017).Written “with her trademark wit and honesty”. It’s the story of her renovation of a Victorian rectory in the heart of the English countryside. She has combined memoir, history, research, story and recipes in this book, which has won a number of international book festivals in the biography category, gained 5 star reviews on Amazon, and has been widely featured in the media. Please let me know if this website is helpful/interesting …! I enjoyed my visit, Julia. Your website has a stylish, uncluttered look.